Dr Cyril Isenberg, a key figure in the School of Physical Sciences and Department of Electronics has been awarded the MBE in the New Year’s Honours List. A physicist with a national and international reputation, he was awarded the Institute of Physics’ Bragg Medal and Prize in 1994 for significant contributions to physics education and innovative contributions to the teaching of physics. He has held numerous positions within the Institute, including Chairman of the London and South East Branch. Dr Isenberg is well known for his science communications activities, and delivers a large number of popular lectures to schools and universities across the country. He has also made numerous television appearances and is perhaps best known as the organiser of the British Physics Olympiad. Over 10,000 UK A-level school students participate every year, out of which five are selected to take part in the International Physics Olympiad. Professor Paul Strange, Head of the School of Physical Sciences, said ‘I am delighted that Dr Isenberg’s huge contribution to physics in the UK has been recognised with the award of an MBE’. 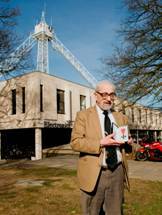 Although Dr Isenberg retired in 2002, as honorary lecturer he continues to play an active role in the School, including the management of the University’s Kent Physics Centre.